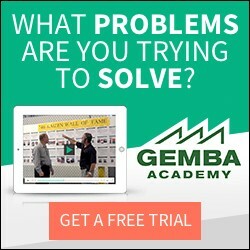 What do you do when you just can’t take people to the gemba as part of your lean training? For example if you are conducting training in a hotel, a university class room or a faraway executive suite, how do you build direct observation into the training? Surprisingly, showing a barrage of photographs and asking students to make observations work rather well. In order to prepare for this, just spend an hour or so taking photographs of everything in sight in your gemba. Walls, floors, workstations, aisles, equipment, inventory, people, visual controls or lack thereof, 5S or lack thereof, office areas, and so forth. Take more photos than you think you will need, because these days digital memory doesn’t burn up actual film material so you can delete your poor photos without creating waste. Once you have found the 20 or 30 most thought and discussion-provoking photos, paste the photos into a presentation, one per slide and away you go. Plan on showing 10-15 photos over a 30 minute period. Ask people to tell you what you see. Touch on what each photo says about the safety, quality or cost of a particular process or area. The photograph is a momentary “reality” or actual condition of that gemba. By capturing that instance and looking deeply into it, we can learn to see the waste or undesirable conditions. Sometimes there is far too much information input when you stand in the circle. Or after several rounds of standing and observing over weeks and months you may no longer see the waste that jumped out at you at first. Focusing on one unchanging image and giving output – your observation of what you notice – is another good way of learning to see. This activity doesn’t yet have a name, but it is a variation on the stand in the circle activity. It is harder in some ways because you have to really focus to find things in each photograph that are of note, from a lean thinking perspective. It may not have been original, but Taiichi Ohno was fond of saying something to the effect of “One hundred words are not as good as one picture, and one hundred pictures are not as good as one action.” So once your students have finished staring at the photographs and they have learned to see a few things, ask that they pick one photo, go to the gemba, make a few improvements as they observed, take a photo and share it with the class. It requires a number of cameras, but it can be quite fun. I think this is all part of visual management. I teach TPM and other topics through visual Power Point slides–not much text, just a visual idea presented as an illustration of the idea. I have also noticed people “see” things in a picture they might not at the actual place. I once had a picture of a department sorely in need of a good Seiri-Seiton action and showed a picture of it during a class without any judgement attached. Members of that department were in the class during the morning session. By the afternoon session, I had new “after” photos of a clean, organized workplace to share. 3. Waste of time used to review and delete unusable photos. 4. reduction in usable life of the camera and memory. Do these wastes outweigh the benifits of the final product, no, but there was waste. Other then that nitpicky rant. I too use this method when teaching or doing lean/5S. As Mike noted it is easier to focus on a picture to find issues, rather then be overwhelmed by multiple stiuli at the gemba. However I feel it is still important to go to gemba before implementation to ensure what you infer from the picture is correct before you implement. Thanks for picking up on this point. I should have said “without creating wasted film”. This is a common debate when teaching lean to engineers, designers, or others whose job involves experimentation and creativity. Is it bad to try more than one thing, knowing that some of your experiments will be a “waste of time”? I think not, as long as you are learning each time so that you don’t continue taking the same bad photos or making the same mistakes. Kaizen is essentially experimentation and learning with the purpose of eliminating waste, variation and unsafe conditions. There is waste inherent in the process of doing kaizen itself, as there is waste in every process.